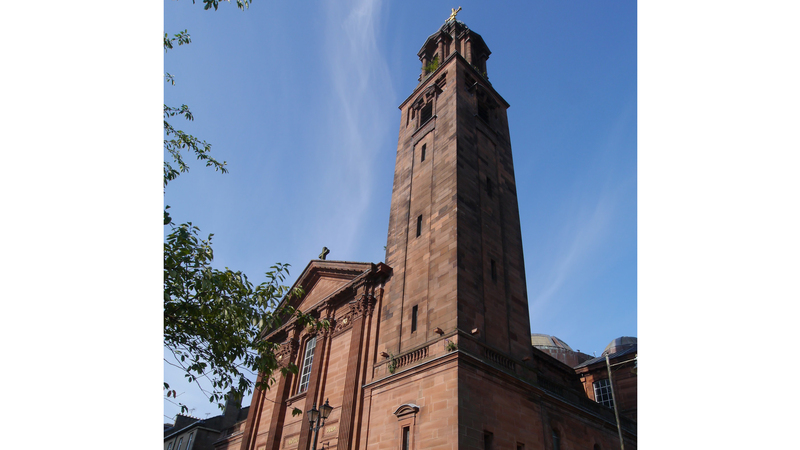 On behalf of the Archdiocese of Glasgow, Mosaic Architecture + Design, one of Scotland’s most experienced practices, has secured a grant of £233,400 from the Heritage Lottery Fund (HLF) for urgent masonry work and external fabric repairs to the iconic bell tower at St Aloysius’ Church, Glasgow known as the ‘Campanile’. The grant enables Mosaic to engage a contractor to start work on the £400,000 project, which starts in April and is scheduled for completion in six months. St Aloysius’ Church is a city centre Jesuit Catholic Church serving the Catholics in Glasgow, the West of Scotland and beyond. Built in 1910 to a design by Belgian architect Charles Menart, its marble clad interior was the work of the Austrian architect Ernest Schaufelberg, and was not completed until 1927, some time after the consecration of the church. In 2004, restoration work was carried out at St Aloysius’, which has been described as ‘probably the most beautiful Catholic church in Glasgow.’ It is built in the Renaissance style of the seventeenth century, after the Cathedral of Namur, Belgium.